What’s in the pest control toolbox? The targets for pest management are adult mating, eggs and neonate larvae which are controlled by mating disruption, ovicides, and larvicides, respectively. The combination of these three tools has proven most effective in keeping fruit damage below the economic threshold. Mating disruption – the first line of defense – delays and prevents mating and egg laying. Mating disruption dispensers need to be in place by 100 DD or bloom, before the first adults emerge at 175 DD, and typically last all season long. Mating disruption is particularly effective as the temperatures increase and dramatically improves the activity of pesticides applied during the season. Ovicides are the second line of defense. Eggs can be prevented from hatching with topical or residual pesticides. Oil is a preferred option; it suffocates the eggs that have been laid. Its residue is short – only about 1 day, but that also means it has little effect on natural enemies. In addition, Trichogramma parasitoids have been shown to help suppress codling moth populations by attacking the egg stage. The third line of defense are larvicides, such as conventional larvicides or codling moth granulosis virus. Both target the newly hatched codling moth larvae which almost immediately bore into the fruit. Therefore, precise application timing is important, because once larvae enter the fruit, they are protected from pesticides. What’s the best insecticide application timing? 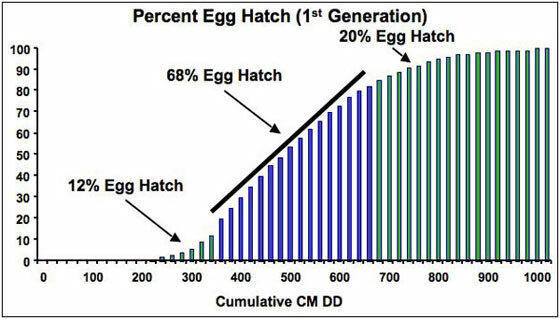 The delayed first cover strategy provides control during the entire egg hatch period. This strategy uses an oil applied at 375 DD to prevent any eggs that have already been laid at that time from hatching. This means that, after this oil application, no newly laid eggs will hatch for another 150 DD (duration of the egg stage). This allows the first larvicide cover spray to be delayed by 150 DD until 525 DD. Now, the larvicide with its stronger residue is active during the first part of the egg hatch period. A second larvicide cover spray is timed depending on the pesticide’s residual activity period. For conventional programs, it is typically about 14 days (see table). So, overall, only the oil spray and two additional sprays would normally be needed to control the first codling moth generation. Organic programs also work very well using the delayed first cover strategy. After the first oil application at 375 DD, virus sprays are applied at 525 DD and repeated every 5-7 days until about 950 DD (see table). The virus residue breaks down quickly in UV sunlight, requiring frequent re-applications throughout the egg hatch period. Mixing oil in with the virus increases control in high pressure situations, killing both eggs and larvae simultaneously. Oil-only programs require re-applications of oil after the initial spray every 200 DD in low pest pressure blocks or every 150 DD in high pest pressure blocks. However, excessive use of oil may cause problems with tree vigor and is unlikely to be needed if using mating disruption and virus sprays. Whether the second and third codling moth generations require additional insecticide applications depends on the pest pressure. It is not always necessary to treat every generation to prevent damage. Remember, mating disruption is still active and keeps reducing the number of eggs laid, which in turn reduces the need for supplemental sprays. Careful monitoring of adult flight with pheromone traps and knowledge about potential infestation sources, such as bins, are essential in determining when treatments are really needed. And even if traps show an unexpected increase in numbers in the next generation, a well-timed intervention will knock down the population again. The time of year also plays a role in pest pressure. After August 20th, virtually all newly-hatched larvae are destined for diapause because of changes in day length. While those larvae still pose a risk for damage and may need supplemental pesticide application, they will not complete development this year into adults that could lay more eggs. Instead, they will enter the pool of diapausing codling moth that will emerge next spring. As a general goal, the number of larvae reaching the overwintering stage should be kept as low as possible. The occurrence of a full fourth generation of codling moth, like in 2015, adds more diapausing larvae to the overwintering population, unless orchards are protected. Low overwintering numbers, however, lay a good foundation for soft and low-input programs in the following year. Management strategies and timing for codling moth control. Mating disruption should always be used. *For 2nd CM generation treatments: add 1000 DD to timings above. *For 3rd CM generation treatments: add 2000 DD to timings above.